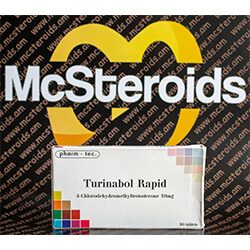 Turanabol Rapid (chlorohydromethyltestosterone) in tablet form manufactured by Pharm Tec. 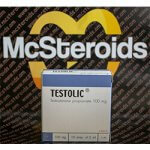 Structurally, the anabolic androgenic steroid chlorodehydromethyltestosterone is a steroid that is structurally a cross between the steroids Dianabol, ie methandienone and clostebol, 4-chlorotestosterone. Oral Turinabol has the same basic structure as Dianabol, which was extended by the 4-chloro group of Clostebol. For this reason, Oral Turinabol is also often compared with Dianabol, but there are also significant differences in effects and side effects of these two anabolic androgenic steroids in addition to similarities between Oral Turinabol and Dianabol. Due to the lack of conversion to estrogen in Oral Turinabol and the lower androgenic effects of Turinabol Rapid compared to Dianabol, in practice it does not produce as dramatic an increase in strength and mass as Dianabol. Its muscle building effects are described by users as being somewhere in between the corresponding effects of Oxandrolone and Dianabol. The gains made by Oral Turinabol, however, are of significantly higher quality than the built-up with the help of Dianabol muscle mass. Due to the absence of estrogen-related water retention, the muscle mass built up with the help of Oral Turinabol has a significantly harder and more defined effect than is the case after a build-up phase with Dianabol. 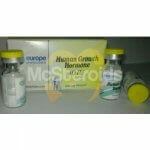 Because of these properties, Oral Turinabol is used during the development phase as well as during the diet phase and competition preparation. Except for bodybuilders, Oral Turinabol is also popular with other athletes, as chlorodehydromethyltestosterone significantly increases strength and performance without causing excessive water-related weight gain. 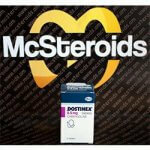 The dosages observed by bodybuilders in practice range from 20 to 40 mg per day. 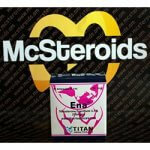 Even female bodybuilders occasionally use Oral Turinabol. Here, the dosages begin in practice at 5 mg per day, with dosages from 10 mg to lead to significant androgen-related Vermännlichungserscheinungen. 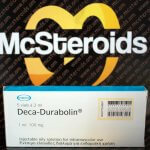 With 16 hours longer than Dianabol’s, Oral Turinabol has more than twice the daily dose of Oral Turinabol. 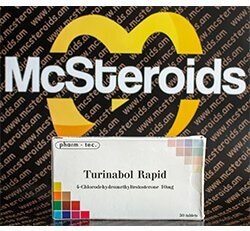 Turinabol Rapid is often considered to be a milder and more tolerable form of Dianabol because it has fewer side effects than Dianabol. Among other things, this is due to the fact that Oral Turinabol is less androgenic than Dianabol, which leads to fewer androgen-related side effects such as oily skin, acne, aggression and the promotion of existing hereditary hair loss. Furthermore, due to the attached 4-chloro group in the body, Oral Turinabol can not be converted from the aromatase enzyme to estrogen like Dianabol. 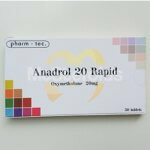 Thus, the use of Oral Turinabol eliminates the estrogen-related side effects such as increased water retention, high blood pressure and gynecomastia, which are often associated with the intake of Dianabol. Since oral Turinabol and Dianabol are 17-alpha-alkylated, both substances have approximately the same potential for hepatic damaging effects.